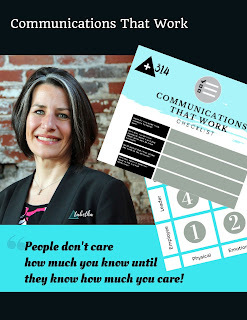 The following is a guest blog post from Tabetha Sheaver, CEO of Plus Delta 314. Her new company focuses on helping customers succeed with adoption of CRM and other solutions. Does your company suffer from poor communication? Poor communication is cited as the #1 reason for employee turnover and project failures. Organizational change management is a discipline that has a number of steps and stages. What is interesting is that whether you ask organizations or change management practitioners 68% of them will say that the communication plan is the most important of the entire organizational change management program. Define your message- What is you want them to know and why? Define the personas – Who will you be communicating to? Do a stakeholder assessment; identify “What’s in it for them?” and what will be their attitude will be i.e. Are they cynical, skeptical or excited. Stakeholder assessments will allow you to segment your groups. Define the voice- What will be the style, brand, and tone of the message. One client I worked with needed to cull 22 TB of old emails down to 11 TB, so we put on a fun ‘Biggest Loser’ contest- the tone was caring, motivational, and fun. Establish the approval structure- Unless you have an internal communications team, chances are there isn’t a formal approval process for getting internal communications approved. Internal communications are often more difficult because you are communicating with individuals, all with different managers. Each manager tends to want to have a different level of involvement and desire for control. Find out who will want to review/approve, who should the communications come from, and how long each manager needs to review and provide feedback. Failure to do this step will end up with hurt feelings, frustration, timeline delays, and politics you just don’t want to deal with. Trust me this is one situation where it is not best to ask for forgiveness later… be proactive and engage the managers now so they will support your message as it goes out. Build out your communications plan – Lay out the purpose of the communication. Who it will be sent to? When will it be sent? After you have the SLA’s for approvals you can back into the date the communications must be written by. Using the personas and stakeholder assessments from step 2, you will need to think about the platform and the delivery mechanism. Stakeholder assessment will help you think through things preferences. For example, sales guys might do better with a short video clip or a town hall, where as accounting people might like a notification on the intranet page where they can dive deeper. Don’t forget to include in your plan feedback loop- all communication should be a 2-way street. How will you capture feedback? I also recommend including a FAQ document. In your communications plan define who will be responsible for keeping the FAQ’s up to date. Write the Content- Now that you have a plan and you know what needs to be written by when, you will need to craft the actual message. Chances are you will have the same basic message but you will need to tweak each slightly for your different audiences. Communications sent to sales people will need to be sent at a different time and with a different length than sending an email to your accounting dept. As you are writing the content take into consideration their DISC personality type and the frame of mind they will be in when they typically check their communication channels. You should also know that people are more likely to take action if you write for the 5 motivators and if your communications include both away and towards statements. Deliver the Content – This is the execution piece! You may need technical resources to help you setup your content delivery. We recommend automating this as much as possible. Through funnels, drip campaigns, landing pages and auto schedulers, it is amazing what you can do to be where your employees need you when they need you! No more people waiting at your door to ask you questions, when done well, you are empowering them to self-service. Monitor your feedback loop – This is the step most organizations do a poor job of because it is time consuming. In the planning stage you put in a feedback loop now you will need resources dedicated to monitoring those channels and responding. We highly recommend creating a system and using tools to manage these communications. Since you diligently planned and executed from your communications plan if anyone says, “I didn’t know” you will be able to go back, pull the info they need, point them in the right direction, and answer their questions with ease. Employees will be happier, more productive, feel supported, and trust that the company is committed to their success because you have invested in good communications.